Have you ever wondered what happened during the first moments of the formation of the universe? How did this shape what we see today? Join us as Grant Mathews steps back in time to confront the first few seconds after the “Big Bang.” Discover how researchers at Notre Dame are working to understand those moments, and learn how the observed remnant glow of the heat of creation, emitted when the universe was only 300,000 years old, gives us an opportunity to study the beginning of time. Additionally, explore the fundamentals of the universe and learn answers to your big questions, including: Is the universe finite or infinite? Why are there only three large space dimensions, plus time? What is the multiverse? Is there evidence for parallel universes? 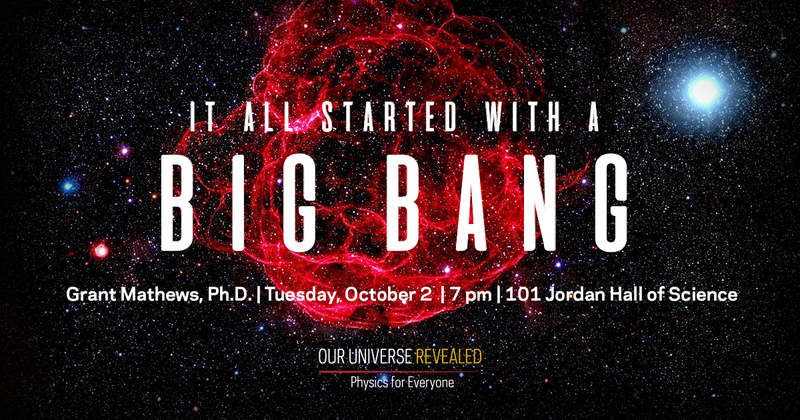 All the answers lead back to the beginning…the Big Bang.